Right around the end of last month, we found a new social game by Disney, and to be completely honest, I didn't think it would be that spectacular. This game, of course, is Pirates of the Caribbean: Master of the Seas. Not only is it extremely popular, but it is also oddly addictive. Something about games like this really draw people in and keeps them coming back for more. First off, it should be noted that Master of the Seas is more closely related to the social games you'd find on Facebook than anything else. So if social games just aren't for you, then you probably won't get much from this one. 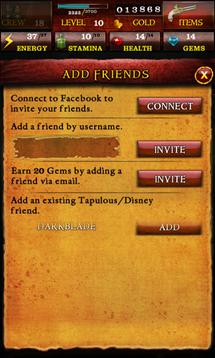 Throughout the game, you're encouraged to connect to Facebook, share with friends, and make friends. While it is entirely possible to continue on without actually connecting to and making friends, the progress will be painfully slow. That being said, on with the rest of the review! 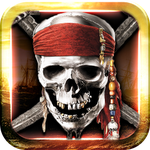 The way this game is played is quite simple - cruise around in your ship from island to island on a mission to complete quests, battle other pirates, and ultimately become master of the seas. Essentially, there are only four aspects of this game you'll have to focus on, and those are your crew, battles, leveling up, and quests. 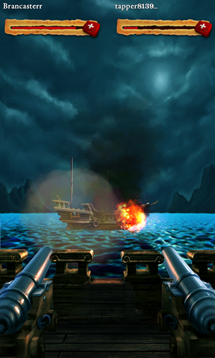 Everything is story-based, so you won't actually be using any controls, steering ships, or firing weapons. To progress in the game, you need to have a trusty crew to help you along the way. Your crew can help you in more ways than one. 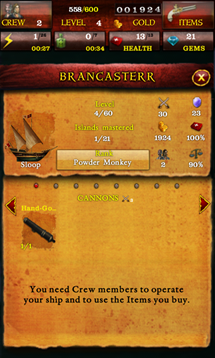 First off, you'll need them to equip more items or complete certain quests. 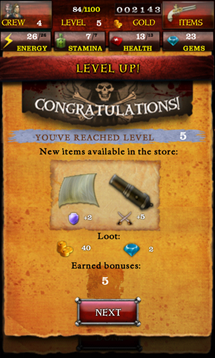 Secondly, they can send you daily gifts like gold, items, more energy or stamina, and much more. 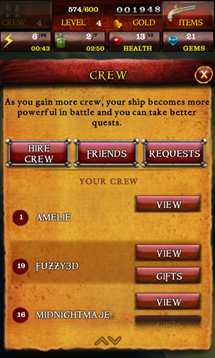 To get crew members, you can add your friends by username, connect to Facebook, or hire them in-game. 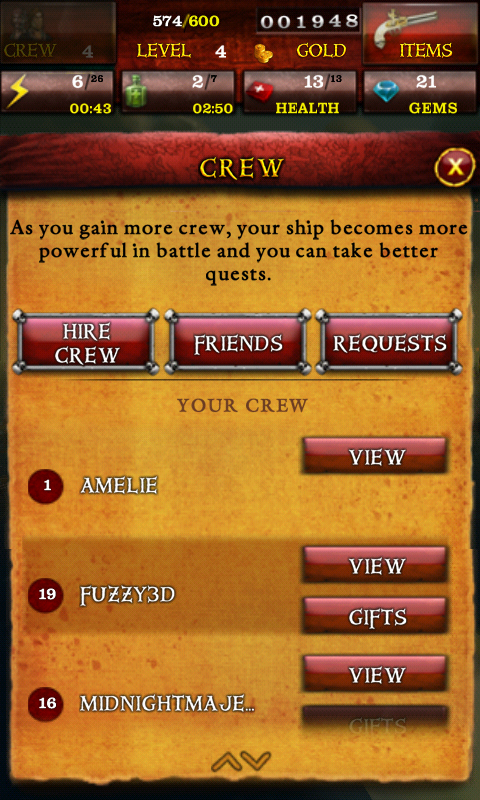 One nice thing about this is that there's no limit on how many crew members you can have, so add as many as you like. 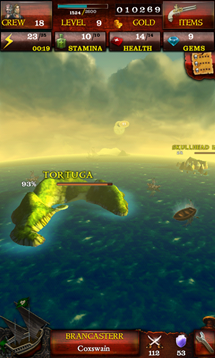 Upon scanning the horizon for land, you'll notice other pirates sailing the waters. By tapping on their ship, you can see see a comparison of their stats to yours, so you can size up your competition before deciding to attack. If you think you can take them, go into battle. I can't really figure out the dynamics of the battle scenarios in this game, but they seem to be turn-based. If you go up against someone who has lower attack and defense stats, you'll win every time. Each round of fire will take one stamina, and if you win you'll get experience points and gold. This part really comes without thinking. Each battle or quest you do will give you experience points, and you'll ultimately level up. 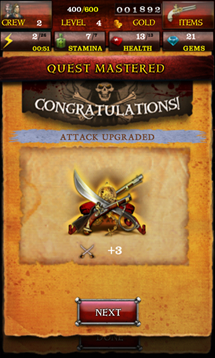 Gaining new levels will upgrade your ship, unlock new islands, and give you stat points. 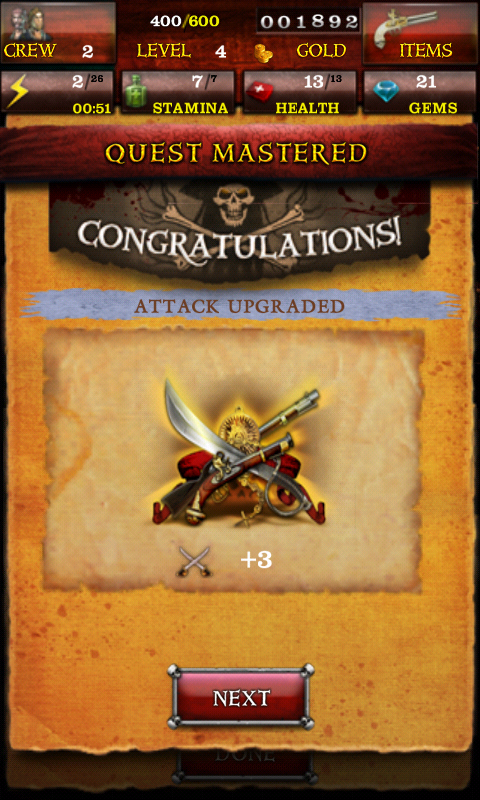 Stat points are used to upgrade attack, defense, energy, stamina, or health. 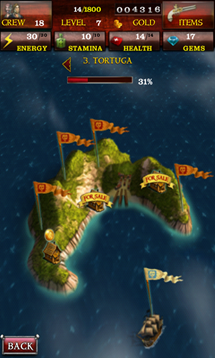 Most importantly, to become master of the seas, you'll have to master every island in your path. 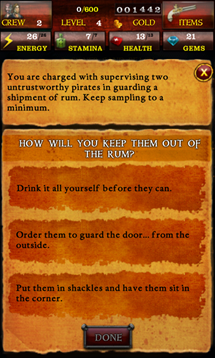 Each island has a list of quests that need to be completed, and you do so by answering questions that test your pirate knowledge. 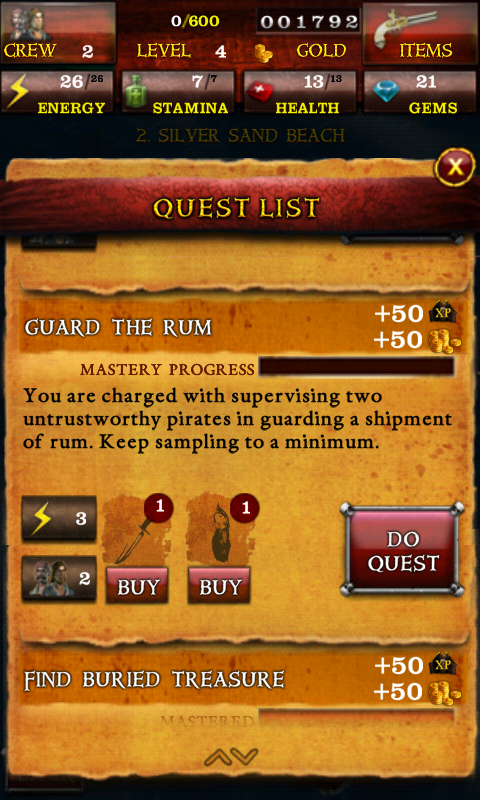 Each quest is going to use up energy, require a certain number of crew members, and often requires specific items. 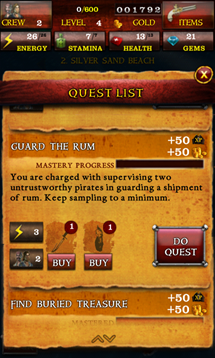 After a quest is completed once, it will need to be done a few more times to be 'mastered', and once every quest on an island has been mastered, the island will be mastered. In addition to all of that, the currency system in this game is also worth mention. 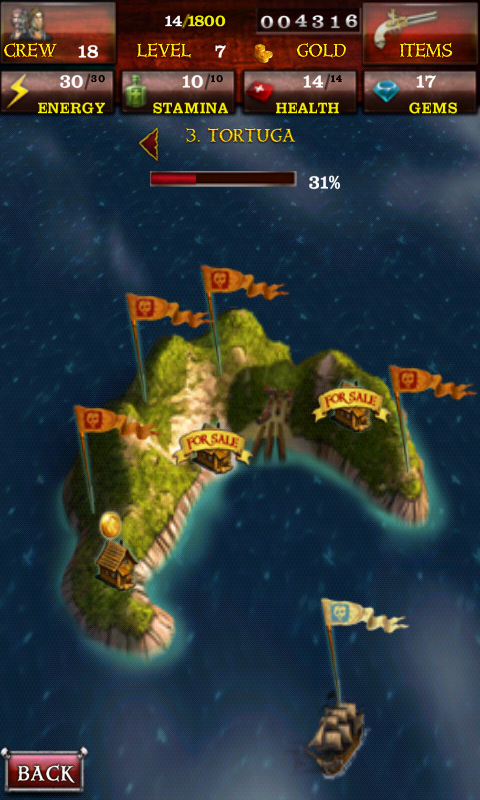 Nearly everything you do will give you gold, and gold is used to buy items for your ship and crew. 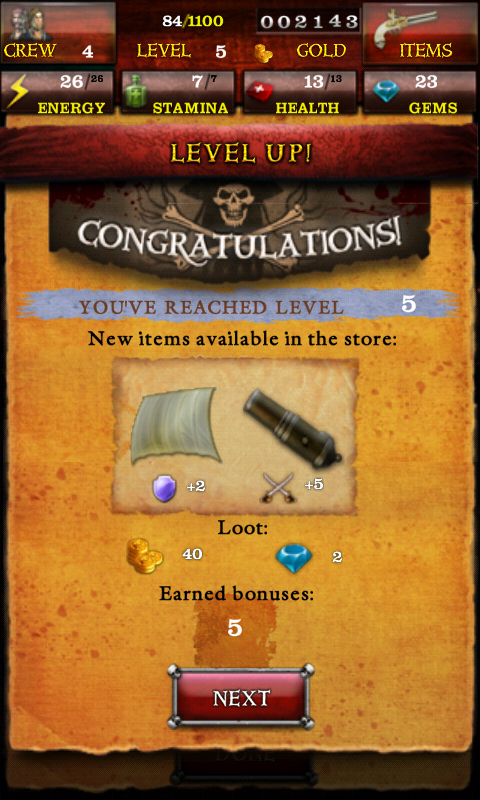 However, you'll also notice that some of the best items can only be purchased with gems. Yeah, you guessed it, these gems can be obtained via in-app purchases, and will really put you ahead in the game. Overall, this game is pretty fun. It is geared more towards social players, so it may not be for everyone. However, the story that goes along with it is fun and interactive, so those that don't normally like games like this can still enjoy it. My only complaint is the fact that connecting to this game can be a nightmare. Sometimes it won't fully load upon opening for the first time, and you won't get any further than the load screen. It will also randomly lose connection mid-game, and will only reconnect if I go into app setting and force close altogether. I'm sure this could be fixed with a simple update, though. So, this looks like an improved, social version of Age of Winds, but otherwise a complete rip off. Or is it created by the same people? 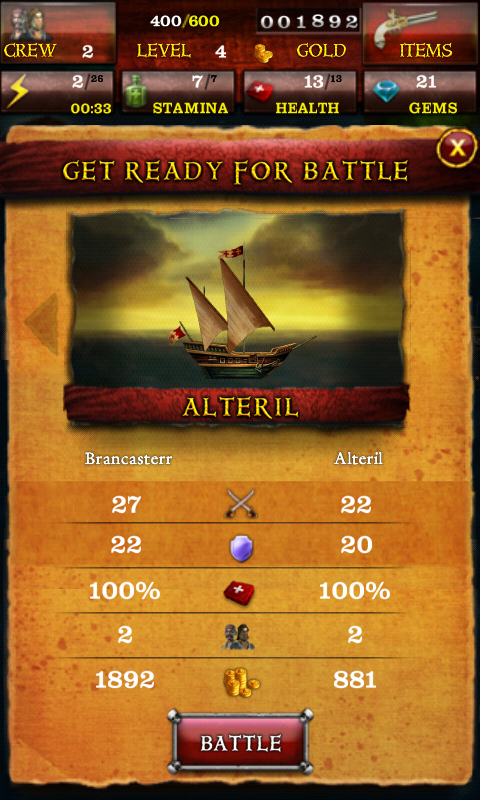 But without the steering ships, exploration aspect of Age of Winds, so maybe not improved except for UI quality. I've never played Age of Winds, but they do looks pretty similar. Master of the Seas is made by Disney. Still sorta fun though. Quite pretty on my Galaxy Note as well. Hey guys add me iPandahacks. I gift all those who gift me so when I add you send me a gift. I am almost the max level with 1m and always gift 50+energy or high level items. No steering ships? Not for me then. Add me...I gift every day...Let's climb the ladder together. Does anyone else have trouble with promo codes no working? Add me please in my Xperia Neo V i cant write anything so i cant invate anyone please add me fflalil FFLALIL Giftds averyday !!!!!! Use code K0R9D4 to get 20 free gems!! A very addictive and fun game. You'll soon need a bigger crew and some GEMS. I send free gifts as often as the game allows!! 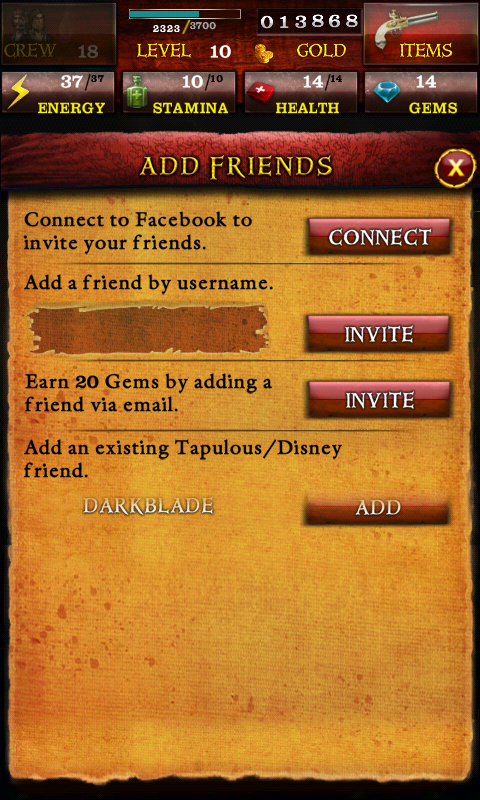 Add me as a crew member, and get 20 free gems. 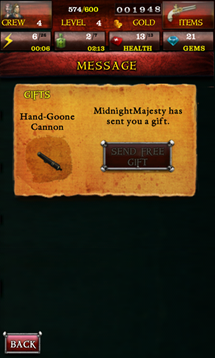 I give a free gift weekly to all crew. N5M9L5. Add me Adm_Leeward. use promo code I1F1E7 to receive a reward.